Finding the perfect blazer jacket for girls is a necessary part of a well rounded wardrobe. 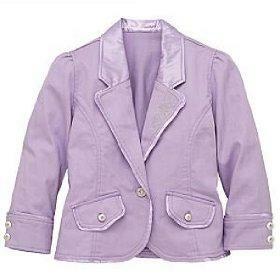 Girls' blazer jackets can help dress up an outfit or even give a young lady a more mature look. Blazer jackets are also very versatile as you can take spring pieces and turn them into fall pieces with the right jacket, extending the life of your child's clothing. Whether you're looking to dress up something you already own, or trying to find that certain look, a blazer jacket can be just the right touch needed to add that extra something special to your wardrobe. Blazer jackets for girls can be both an item of clothing and an accessory. Blazer jackets for girls come in a variety of styles which really helps pull together an entire look. Classic blazers are just that-crisp, clean lines and slightly tapered at the waist-they bring out the elegance in any outfit. Most blazers are dark colors like grey, chocolate, black or navy blue. Usually classic blazers are a straight cut and hang a few inches beneath the waist. Sometimes classic blazers are also referred to as schoolgirl blazers. Dressy blazers are ruffled at the shoulders and perhaps even the sleeves and the waist. One popular look is a straight banded waist with a puckered bottom. These blazers are generally for special occasions and tend to give off a more mature vibe. Cropped blazer jackets are longer than baleros but definitely shorter than a typical blazer. Some can simply hang, but often you may see them as tapered-become more form fitting around the waist before stopping just short of the jean line. What really sets apart a lot of blazers is the attention to detail. Buttons, trim and even inside lining can all bear the signature mark of the designer. However, you shouldn't feel like you have to pay exorbitant prices to get stylish blazer embellishments. You can add embellishments to your own blazer creating a one of a kind piece that truly matches your wardrobe. The lining in a blazer is cute when it coordinates with the outside color of the blazer. Sometimes there is lining in the sleeves so that if you choose to roll up the sleeves of the blazer, you have a cute and sassy look that coordinates. Common linings in blazers for girl include floral prints that give femininity to the blazer. One way to embellish plain blazer jackets is with attention to detail in the buttons. While most blazer jackets have gold, silver or brass colored buttons, you can easily change and swap them for something cute and trendy. Try getting buttons that are shaped like animals for a little girl, or fabric buttons that coordinate with the blazer for a tween. You are limited only by your creativity. You can also use some Stitch Witchery to add trim to pockets, small bows or trim along the collar. To do this, choose trim and coordinating details that help complete a specific look for an entire outfit. Dark velvet trim in a similar but darker shade of the blazer gives an overall classic and dressy look. Trim in a lighter color can give a fresh, more spring like look to the ensemble.